The e-reader field is getting more crowded. Barnes & Noble and Kobo are getting into the game with a new breed of touchscreen e-book readers, set for release in June. The devices promise a sleeker experience at affordable prices. Amazon's Kindle is getting a run for its money. Can it keep up? Out this summer is the third generation Kindle from Amazon, the new touchscreen Nook from Barnes & Noble and the new touchscreen Kobo eReader. Here's a primer on how the three stack up. The Nook and the Kobo feature only Wi-Fi connectivity. The Kindle offers 3G connectivity. Amazon is selling for $189 the 3G + Wi-Fi Kindle, and in response to the new competitors, the company also slashed the price of the 3G model to $164 -- if you don't mind grayscale advertisements on your Kindle screensaver. Taking 3G out of the equation, there's a tight price battle: the Kindle cost $139 ($114 for the ad-supported edition), the touchscreen Nook costs $139 and Kobo's new touchscreen e-reader comes in at $129. The pricing differences aren't significant, so take a closer look at the devices to find your best fit. 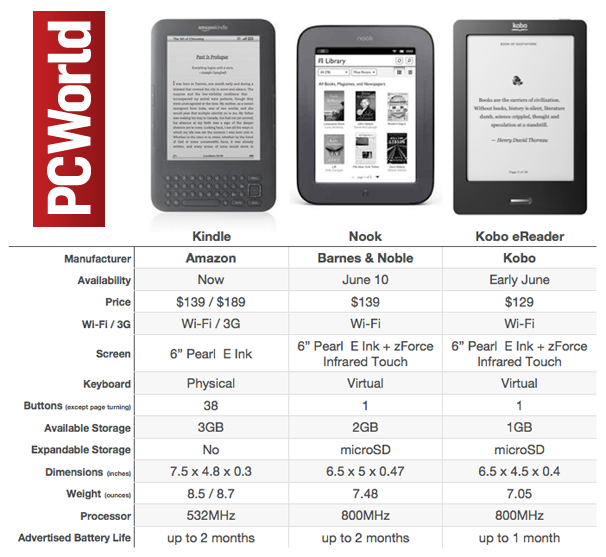 All three e-readers feature a 6-inch Pearl E Ink display, but that's where the main differences take over. The Kindle uses almost 40 buttons to navigate through the interface and menus, while the new Nook and Kobo use zForce Infrared Touch technology to create a touchscreen layer on top of the E Ink screen. This is meant to make navigation easier and the software keyboard pops on screen only when you need it, rather than having the buttons permanently under the display -- and this is where the two new e-readers have the edge over the Kindle. Because they don't have buttons, the touchscreen Nook and Kobo eReader are slightly shorter and lighter than the Kindle, but the extra technology enabling the touchscreens makes them thicker than the Kindle. Storage-wise, the Kindle bundles the most built-in storage for your buck at 3GB available, with the Nook at 2GB and the Kobo at 1GB (which is still plenty of storage space for e-books). However, the Nook and Kobo feature microSD card slots, which means you can expand the storage to up to 32GB. With a sleek design and solid features, the Barnes & Noble touchscreen Nook is the standout e-reader out of the bunch. My colleagues Robert S. Anthony and Melissa J. Perenson had a hands-on with the new Nook and also believe "the Nook now has an edge over its arch-rival, the Amazon Kindle." They also like the Nook's snappy touchscreen and simple interface.